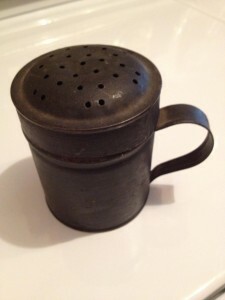 These tin spice shakers were very common around camps and households. They were big enough to where you could mix several of your favorite spices together and have them all in one shaker. I found this one while at an antique store in Tenn. Nice period piece that had everyday use, and is still around today.